LinkedList class extends AbstractList class. 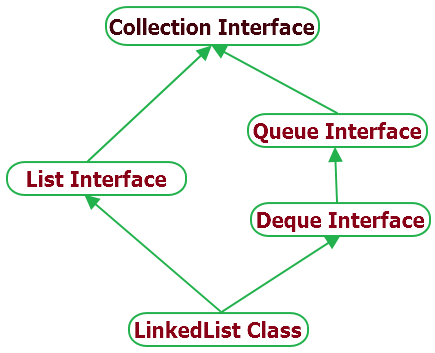 LinkedList class implements List and Deque interfaces. LinkedList class is using doubly linked list to store elements in list. LinkedList can hold duplicate elements in list. Manipulation is faster in linkedlist as shifting is not required when new element is inserted or deleted from list. You can use it as list, stack or queue as it implements List and Deque interfaces of collection framework. Bellow given example will show you usage of different methods of linkedlist class in java. // Add elements using add method. // Add element at first position in list using addFirst. // Add element at last position in list using addLast. // Add elements at index 1 in list. // Removing first item from list using removeFirst method. // Removing item from list using value. // Removing item from list using index. // Get item from list using index. // Set item at given index in list.